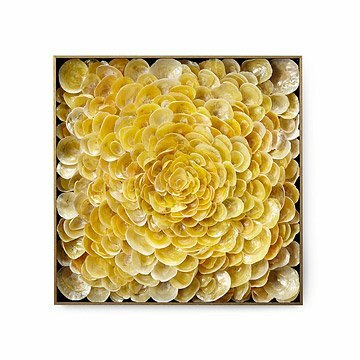 This wall sculpture is made from carefully collected and composed jingle shells. Artist Valerie Carmet transforms the childlike wonder of collecting seashells at the beach into sophisticated works of art. This piece is made of scores of iridescent, ocean-cleaned jingle shells, collected along the coast of Long Island. The artist then carefully assembles selected shells into a flower-like composition that's part collage, part mosaic, and part sculpture. It's mounted in an elegant, floating metal frame that provides compelling contrast to the organic and infinitely varied forms of the shells. It makes distinctive decor for an ocean-lover's office, beach house, or any space that could benefit from the allure of the sea. The piece comes individually signed and numbered by the artist. Handmade in New York. Valerie Carmet is a French/American artist living in New York City since 1989. After working in the fashion industry for 10 years Valerie went on to pursue a new passion in Mosaic design. As a mosaic design artist, she introduces groundbreaking techniques to modernize the centuries old mosaic art to the level of contemporary interior and exterior designs. She uses traditional mosaic tiles, stained glass, dishes and mixed media as well as recycled materials such as seashells, toys and others mixed with modern supplies and innovative ideas to appeal to her sophisticated clients for all their interior design needs. In the past 15 years she has designed piece of art for kitchens, bathrooms, floors, walls, pools as well as decorative objects, fine art and much more. Valerie new collection of home interior decorative accessories is influenced by her passion to reuse discarded material and create art pieces for the pleasure of the discerning eye. 11" H x 11" W x 2" D; 4.5 lbs. This is a stunning piece! My 4-year old son said "THAT'S BEAUTIFUL" when we opened it... The piece fits effortlessly into our decor and is truly a conversation piece. Probably have to clean with compressed air, as it's delicate, but the piece is simply stunning. I will be ordering the entire collection of 3, as these are one-of-a kind masterpieces. You can't go wrong!